As part of their degree studies, our Team Entrepreneur students were set the challenge to develop proposals for extensions to Anchor Society’s services to the elderly. The Anchor Society aims to support isolated and lonely elderly in Bristol and the surrounding area with financial and housing support as well as visiting and befriending them. The students were set the challenge by CEO of the Anchor Society Richard Pendlebury MBE DL, with help from Behind the Scenes, who specialise in the production of live experiences. Richard presented the brief to the students during a day-long workshop on social entrepreneurship. The event was hosted by Burges Salmon who provided full conference facilities in their Bristol head-office whilst the challenge was being set. The Team Entrepreneur students had under two weeks to work on the project and come up with proposals for Anchor Society which were presented back to a panel consisting of Richard; Laura Barrell, Behind the Scenes and Vicki Underhill, Burges Salmon. Vicki added “I was blown away by the professionalism of the presentations for the client. In the short time allocated, the students really grabbed the challenge and spotted the opportunities”. 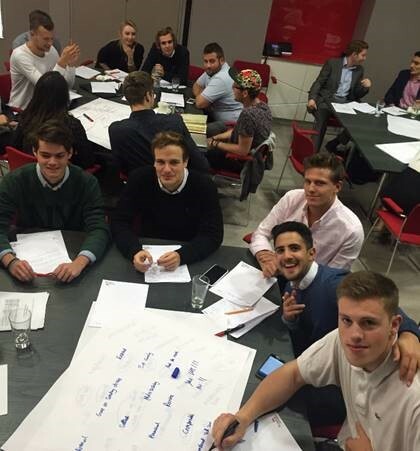 Team Entrepreneur is a ground-breaking, innovative and entrepreneurial degree which gives students the opportunity to set-up and run their own team company; to ‘learn by doing’ whilst gaining a broad-based business degree. More information can be found on the degree here. Next Next post: Business skills for a vibrant economy – are you equipped for the post-Brexit world?